This project at Lakeview Campground is upgrading the electrical pedestals from 30-amp to 50-amp service. To date, 19 of the 37 30-amp electrical pedestals have been upgraded. This project will enhance the visitor experience at Lake Minatare State Recreation Area by modernizing infrastructure and improving the camping experience at the Lakeview Campground. Bureau of Reclamation Commissioner Brenda Burman announced that Reclamation is providing $69,000 to the Nebraska Game and Parks Commission. The funding will be used to complete the upgrade of electrical pedestals in Lakeview Campground at Lake Minatare State Recreation Area. "Recreation is important part of the Reclamation projects throughout the West," Commissioner Burman said. "This project will enhance the visitor experience at Lake Minatare State Recreation Area by modernizing infrastructure and improving the camping experience at the Lakeview Campground." This is a continuation of a project at Lakeview Campground where they are upgrading the electrical pedestals from 30-amp to 50-amp service. Reclamation previously provided the Nebraska Game and Parks Commission $68,450 to begin the electrical upgrades. To date, 19 of the 37 30-amp electrical pedestals have been upgraded. Lake Minatare is the Nebraska Panhandle’s largest body of water, attracting thousands of anglers, campers, water skiers and swimmers each year. As part of the North Platte Wildlife Refuge, the lake also is a haven for waterfowl and other fauna. 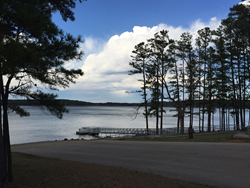 It provides opportunities for modern and primitive camping, picnicking, swimming, boating and fishing. It also is the home of Nebraska's only full-size lighthouse. Learn more about the Lake Minatare State Recreation Area at https://outdoornebraska.gov/lakeminatare/. The dam was built by the Bureau of Reclamation and receives water from Guernsey Reservoir and Lake Alice by two separate canals. It is part of the North Platte Project that provides full-service irrigation to 220,000 acres and supplemental irrigation service to 109,000 acres. Learn more about Minatare Dam and the North Platte project at https://www.usbr.gov/projects/index.php?id=178.